My name is Alexis Figueroa. I was born in 1976 and was interested in art from an early age. I married my wife Rina Herrero in 2003 and afterwards I started collecting art. It was in 2006 that I bought my first painting. A big 30"x40" landscape by a famed local Puerto Rican artists Wichie Torres. It wasn't my favorite painting of him but I had the money on hand and decided to buy it, I don't think I would ever be able to buy one of his painting if I didn't do it at the moment, so I did. Later that year I met a lot of young and very talented artists and figuered I should help them in some way but I didn't know how. This is when I thought of doing an exhibition where young upcoming artists would have the chance to exhibit their work with other artists of their generation from different countries. 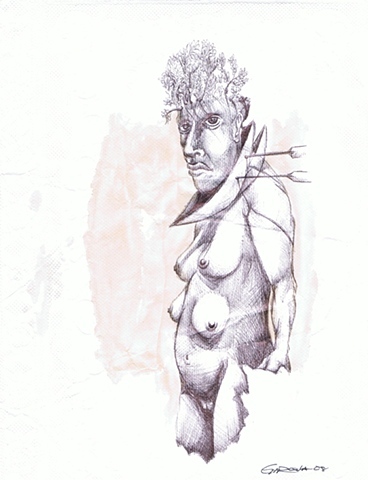 The exhibition was titled 33 Drawings: Emerging Artists you should know. Most of the artist were from Puerto Rico but I invited In-Sung, Jae from South Korea, Donald Fodness, Alex Paik, Mark Fox and other artists from the USA. The show was great and all 33 drawings were sold. I took no comission and all the money went directly to the artists. This helped me become more interested and involved in arts and motivated me to continue to work with the young artists understanding that they are easier to deal with. Over the past years I have developed extremely good friendships and relationships with the artists and for that I'm very greatefull. I have made friends and helped some of them on the way. As a art enthusiast specializing in the younger artists I have managed to obtain various pieces of artwork as comissions instead of money. This way I have been able to build my own collection which grows everyday. I am very proud of my small collection since most of the artwork has a story behind it. I collect mostly drawings and small paintings because that's what I can afford and it's what I rather recive instead of commission money. A lot of artists give drawings and sketchs as gifts that I keep and appreciate very much. The collection dosen't have a lot of big paintings of the artists but is what I have been able to gather with an extremely limited budget and limited wall space. Hope you enjoy my collection as much as I do everyday. PS Go to news and get the Artist Links as posted on the website for refrence on specific artists you might like or already know.